US-based PAC Machinery has introduced a new Rollbag R1285 Velocity automatic bagger, which is designed for mail order fulfillment packaging of poly mailers. The company has unveiled an advanced automatic bagger at this year’s Pack Expo East event in Philadelphia, US. PAC Machinery has also exhibited products from its group companies at the event, including Packaging Aids, Vertrod, and Clamco. Featuring next-bag-out print technology, Clamco’s Rollbag R1285 Velocity automatic bagger incorporates a platform with direct-to-bag printer and variable data software. The new printer can be used in different applications, including printing of delivery address, barcode, product info, and return address directly on the bag. 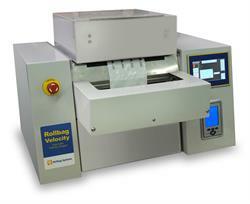 Rollbag enables to avoid the use of paper label, helping to save time and effort to print and apply the label. It enables to effectively carry out bagging and printing on coex poly mailer material, and is designed to work with Rollbag brand pre-opened bags on a roll. Poly mailers and multiple other types of bags on a roll are available from Converting Technology, which is a brand of PAC Machinery. PAC Machinery’s San Rafael national sales manager Matt Cmeyla said: "Pack Expo East was the ideal venue for introducing our Rollbag R1285 Velocity automatic bagger as the show provides an environment where our prospects are the most receptive. Based in San Rafael of California, PAC Machinery produces equipment and materials, which can be used in various applications of the flexible packaging industry. Image: Clamco’s Rollbag R1285 Velocity automatic bagger. Photo: courtesy of Marketwired / PAC Machinery.